Return to our opening page. Curriculum Research and Evaluation, Inc. designs and implements evaluation studies for projects that are dedicated to the professional development of school teachers and other professional educators. Our field based data collection strategies help ensure that project officials and funding agencies receive timely feedback and analysis to support decision making and process improvement. For 25 years CRE has been conducting research-based evaluations of cutting edge educational programs. This document presents a summary of the philosophy, leadership, and strategies that our most successful clients use to achieve their goals. 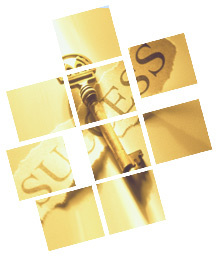 Here are the keys to your success. Our current evaluation study areas. How to contact Curriculum Research & Evaluation, Incorporated. Success is a product accomplished by a small effective group. It develops from having a determination to succeed, doing hard work, providing freedom to argue and discuss issues and esprit de corps. When these elements are weak a program suffers. When any are absent the program is clearly unsuccessful--a waste of everyone's time and money. The following guidelines include some of the most important elements evident in every successful program that CRE has evaluated. Assemble a group of very capable men and women with diverse characteristics who are highly committed in the long term to accomplishing the program's goals at the highest level. Work with these individuals continuously to forge a team that is as proud to work on this program as they are to work with each other. Welcome and guarantee freedom of expression. Foster individual initiative and responsibility. Generate group processes to assure fair play and effective overall program development. Create a schematic diagram of the program's goal and objectives and post this in the office where people will notice it daily. Read it, think about it, disseminate it and critique it. In consultation with supervisory persons or administrative units revise objectives as needed to overcome obstacles. Use a formal procedure to establish the organizational framework for authority, responsibility and decision-making. Follow it closely. Anticipate but strive to avoid turnover in key leadership positions. Listen well to criticism especially when the remarks come from an external source. Use this to improve or at least to examine the program. Maintain a regular professional relationship with administrators from the parent organization or funding sources. Routinely provide updates on your program's progress as well as descriptive data on its operations. Develop creative and interesting as well as practical activities and materials that help accomplish the program's objectives. Revise and expand these products as needed. Be wary of covering too many bases and spreading operations too thin. Always maintain the focus on what is essential and widely recognized as beneficial. Hire the best subcontractors or consultants (based on their reputations) that you can afford when they are needed. Assemble key participants on a regular basis to conduct formal and informal strategy sessions that clarify operations and solve problems. Start every meeting by stating the meeting's purpose and time frame. Introduce new or unfamiliar participants. Disseminate a detailed agenda well in advance of the meeting and abide by it. Use the same formal procedures such as Roberts Rules of Order for every official meeting including preparation and reading of minutes. End every meeting by adopting a clear set of instructions for follow-up action including assigning specific responsibility for operations. End meetings on time. Maintain clear and professional communications with all participants at all levels of the program. Assure and strive for consistently good understanding between everyone. Recognize everyone's accomplishments in a timely and appropriate manner. Celebrate the program's highlights when they occur. Make plans for advanced program development on a regular basis. Document and officially review plans. At the mid-point Review the program's original goal and commitments and if necessary scale-up the operations. Rely on an external evaluator for timely, critical and informative reports. Routinely publicize the results of your program in meetings, newsletters, articles and conferences. Constantly uphold the virtues of loyalty, honesty and fairness. © Curriculum Research & Evaluation, Inc.